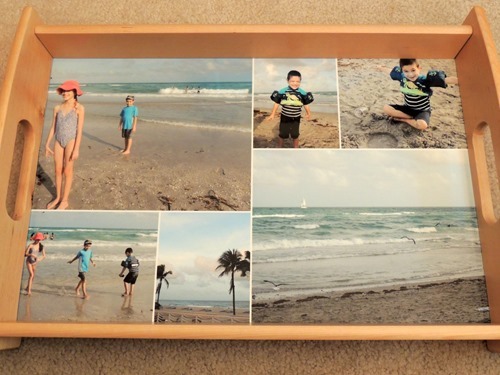 I always love turning my photos into memories and using them to design custom products. 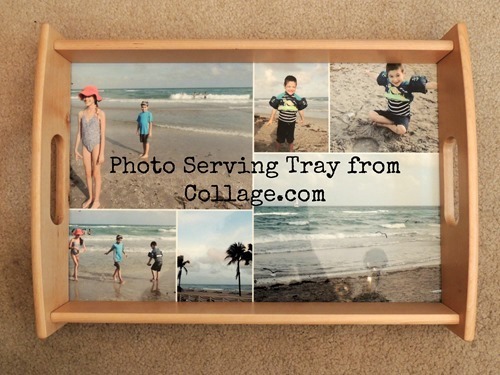 I have partnered with Collage.com in the past and this time when I was asked to review one of their products, I decided to choose a custom photo serving tray. Because I ordered it before this most recent vacation, I used photos from our last trip – to Florida this past winter break. I specifically love using Collage.com because their designing software is so simple. All you do is add the photos that you want to use, and the software arranges the photos into a collage. You can rearrange as you wish and you can add text or backgrounds, but I really love the simplicity of putting together a collage of my photos – and viewing it right on my screen on the product I am ordering. The serving trays are high-quality hardwood and are available in natural wood or expresso finish. 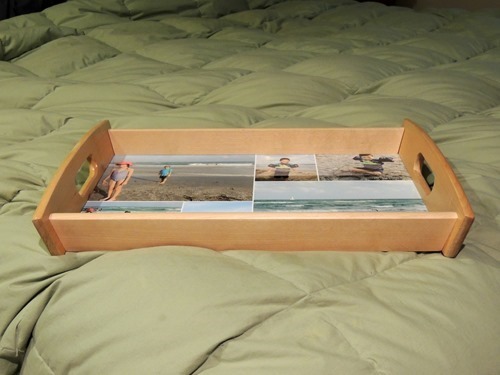 Two sizes are available – an 8×13 cocktail tray and an 11.25×17 meal tray. Mine is the larger tray and I chose a natural wood finish. 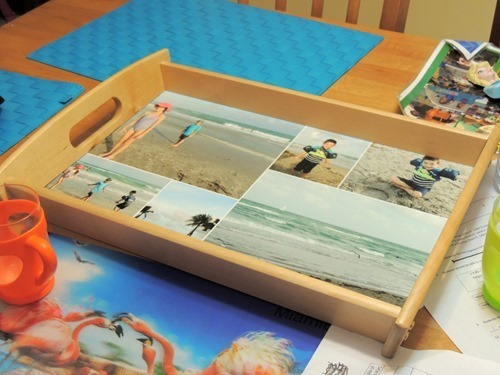 Now, I was not necessarily planning to use the tray as a serving piece and hoped to use it more as décor in my home – maybe I should have considered this better though, because now I am not sure I want to put things on top of my kids’ photos! 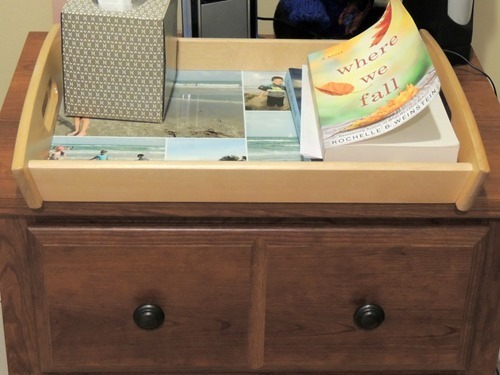 In any case, there are many ways to use a serving tray, and here are some of the places in my house that I considered putting this one. On the bed: Bring me breakfast in bed on my tray any time…although truthfully I’m not much of a breakfast in bed person – I prefer breakfast by the computer! 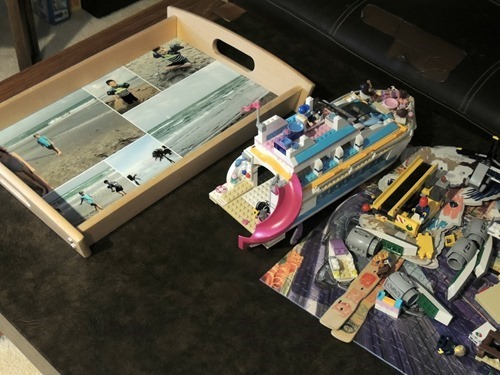 On the coffee table in the living room – maybe organize some of those Lego projects? On the kitchen table – as a serving tray! I think I prefer the way it looks in the bathroom. 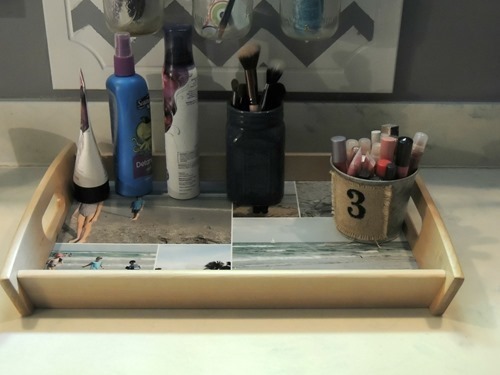 Our bathroom is semi-beach themed, so even though the photos will be partially covered, it will match! What do you think? If you are looking for a fun custom photo product, make sure to check the current deals from Collage.com! Have a graduate in the family? Visit this graduation gift guide!